Chaparral’s new 243 Vortex VRX sets a new standard for jet propulsion runabouts. After the 1990s when the PWC market cooled off, jet boat sales cooled as well—until the resurgence in jet popularity which we documented in New Jet Boats: A Renaissance is Underway. One of the issues with early iterations of jet boats was that they were never very substantial. Most of them were in the 14’ to 16’ range and many consumers viewed them in the same light as they did PWCs. In other words, as toys. But as the jet boat market heats up again, it would be hard to view the latest crop of boats as toys. 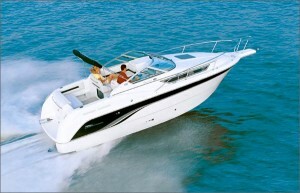 The new Chaparral 243 Vortex VRX is a great example. 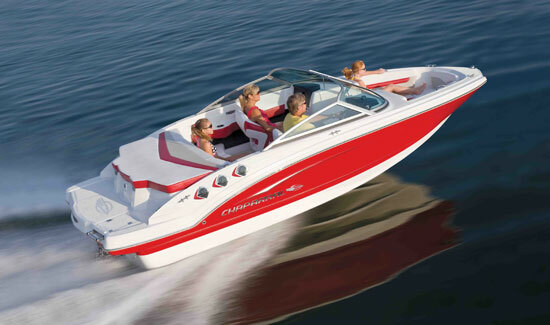 The 243 is Chaparral’s top-of-the-chart model in a lineup of six jet boats, and there’s a lot to like about it . 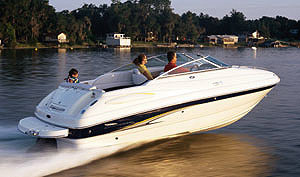 Buyers can choose from twin 200 or 250 HP Rotax three-cylinder, four-stroke engines. 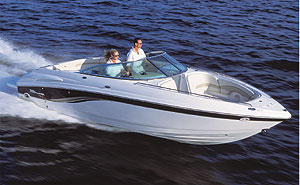 Yes, twin engines for a combined 400 or 500 horsepower in a runabout with a base MSRP of $59,995. The powertrain comes with a couple of nifty features, too. First is the intelligent throttle control, which provides preprogrammed acceleration curves in “ski” mode. That’s handy on a jet boat because out-of-the-hole acceleration is much stronger than a stern drive boat. The 243 also has “eco” and “docking” modes, which respectively dial in the most efficient cruising speeds and rescale the throttles for improved maneuverability. Some other features take a lot of headache out of owning and operating a jet boat. For example, the driveshaft has a sleeve around it, so if a tow rope slips under the boat and gets sucked up into the jet intake, it won’t get wrapped around the driveshaft. Closed cooling is nice, too, especially if you go boating in saltwater. The driver has control via a standard Vortex touch screen or the optional Medallion touch screen. The single screen keeps the helm clean and simple, with two gauges to either side, some switches below to the left, a steering wheel, and a throttle. In the bow, the 243 offers a full-featured anchor locker with a telescoping ladder. There’s also a bow filler cushion, ample stowage beneath the lounges, a head compartment, and a wind dam between the windshield cowls for those chilly mornings. When you wander back to the cockpit, you realize another benefit of jet propulsion is how much room there is. Deck space is ample and the walk-through to the swim platform isn’t as high as on stern-drive runabouts because the engines are so compact. Another nice thing? No one can cut their feet on the propeller—because there isn’t one. 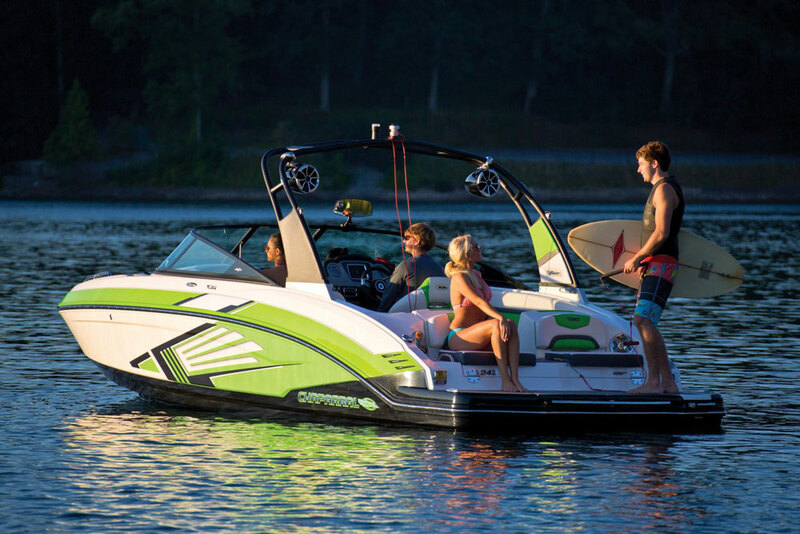 The swim platform on the Chaparral 243 Vortex is fitted with nonskid decking, a swim ladder offset to starboard, and two rear-facing bucket seats. 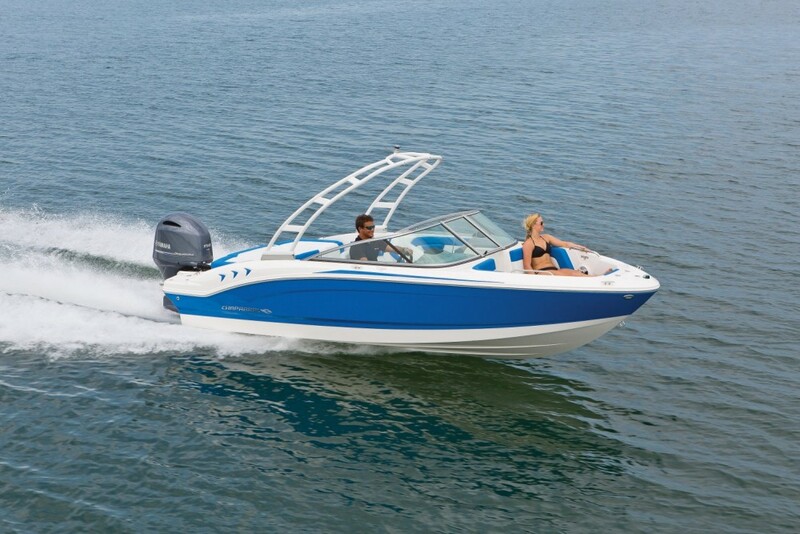 The tower and ballast systems are optional, but look at what comes standard on the 243: a transom shower, ski mirror, removable dinette table with bases in the cockpit and swim platform, 25-quart cooler, snap-in carpeting, 12-volt power outlet, depth finder, hour meter, tilt steering, and stereo remote. That standard equipment list doesn’t sound like what we used to see on earlier jet boats. 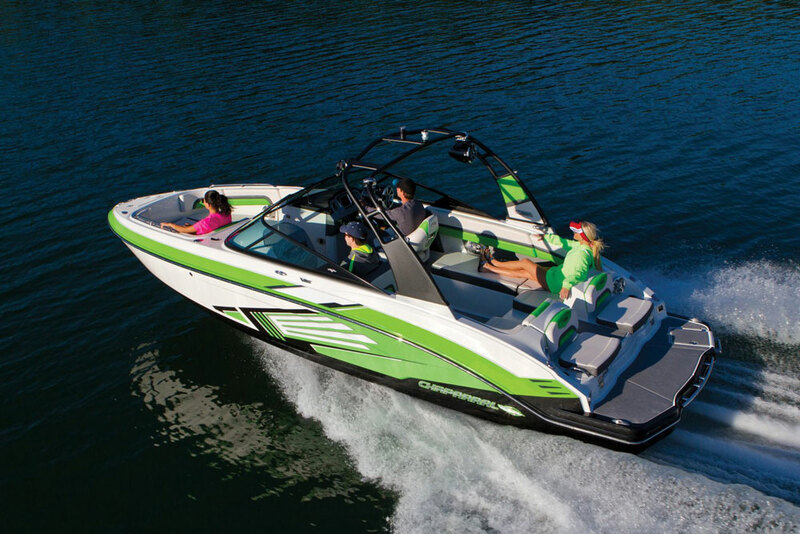 It’s more like one for a well-equipped family runabout, which for all intents and purposes, is exactly what the Chaparral 243 Vortex VRX is. It just does it without a propeller, and there’s a lot to like about that. 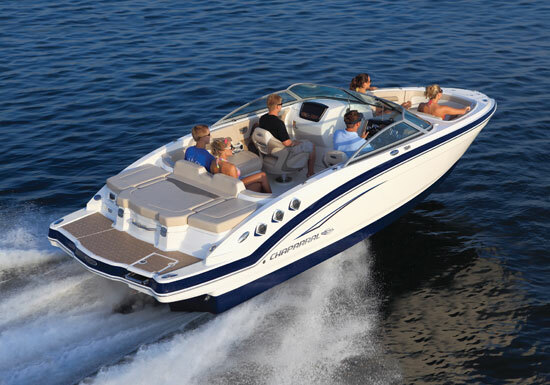 Other Choices: The Scarab 255 is another jet boat that's more boat than toy. Same goes for the Yamaha 242. 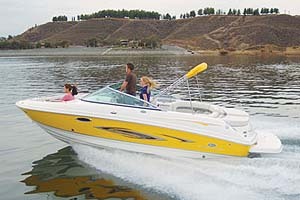 View listings for the Chaparral 243 Vortex VRX. For more information, visit Chaparral.